The next target of my Bayonne Pizza Blitz was just a block up Broadway from Ronny’s Pizzeria and Restaurant. 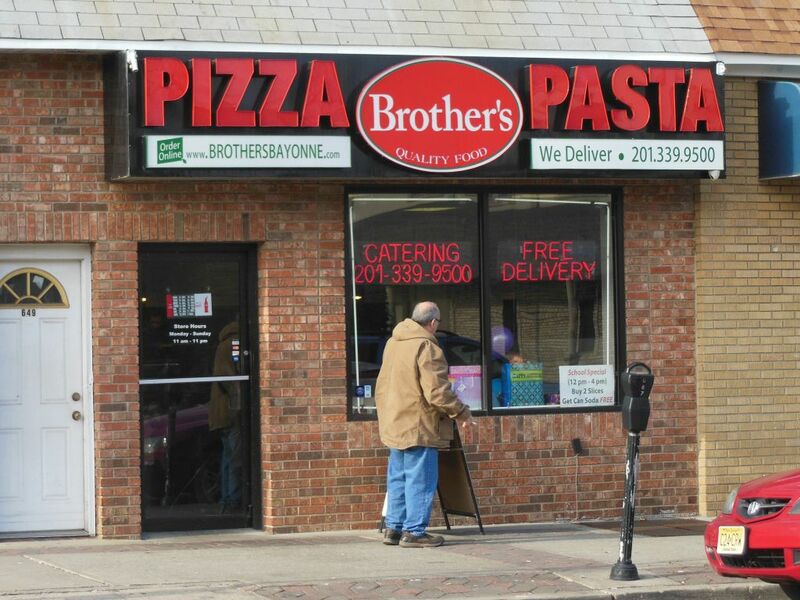 Brothers Pizza & Pasta was new to me, but many locals on the Bayonne Facebook page said great things about this family-owned and operated business. Entering the small joint, I made my way through a packed house of young children celebrating a birthday party. Getting to the counter, I ordered the requisite $2.00 plain cheese slice while succumbing to the fact that there would be nowhere inside for me to eat it! Aside from the facts that their room is small and that there is no counter space from which to scarf a slice, Brothers looked to be the usual generic Jersey pizza joint. They offered specialty slices and the usual things you would expect from a place like this. 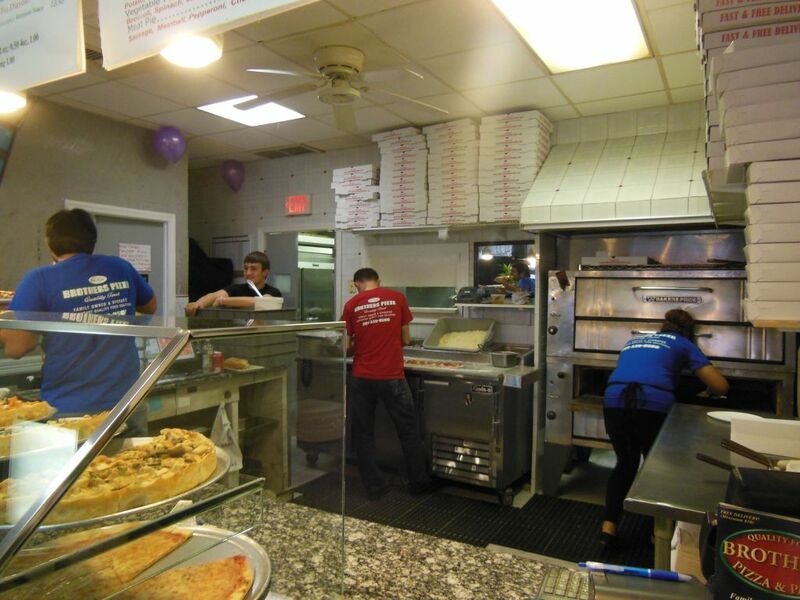 They do stretch out a bit in the pizza department by also offering pan and stuffed varieties. While waiting, I watched the day’s San Francisco-Carolina NFL playoff game on the hanging flat screen. Joining me was the rather boisterous birthday dad who was diverting most of his attention to the game rather than the birthday party. These kids were on their own since that looked like their uncle who I encountered standing out front grabbing a smoke. As they threw my slice in the oven for its reheat, I noticed that it looked a little smaller than usual, but it came out looking great with a generous coat of oil on top. The bottom was toasted crispy to reveal a delicately browned crust. Each time I eat an unfamiliar slice, I start by finding the reasons why a slice might not get a perfect Snob score. I soon came to the conclusion that there was simply nothing wrong with Brothers’ slice. This one must have been made by an honors graduate from the Bayonne school of pizza-making! 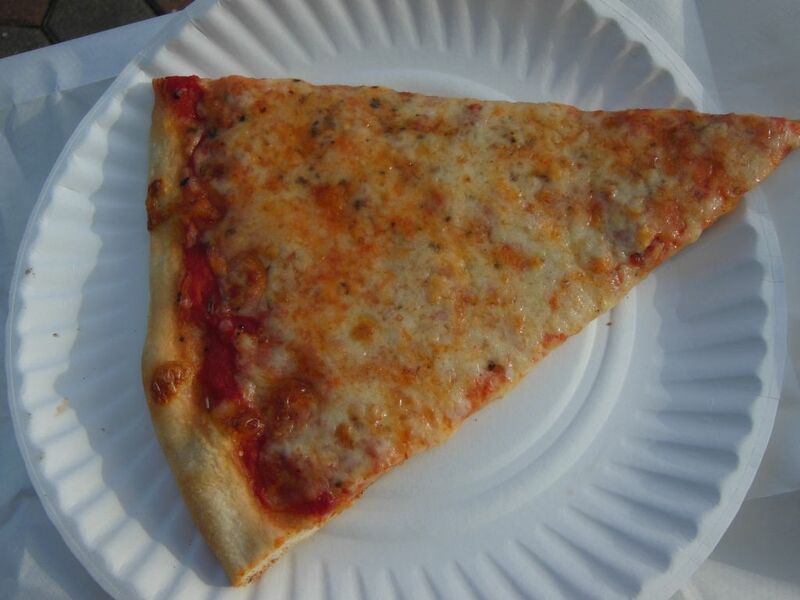 Comparing this slice to some other Bayonne slices I found that the cheese had a slight run to it. When I think about it, I take this as a good sign that they used just the right amount of Mozzarella. The cheese needs to move a little! The delicious tomato sauce was boosted by a light flavoring of oregano which made for one tasty piece of pizza. The fact that I had to eat this one while standing outside on Broadway did not distract me enjoying the splendor of this slice. My Bayonne Facebook friends were right—Brothers slice is a true winner!